A week before Christmas, Paula G. and her husband visited the Capital Area Humane Society (CAHS) near Columbus, Ohio in search of a dog. 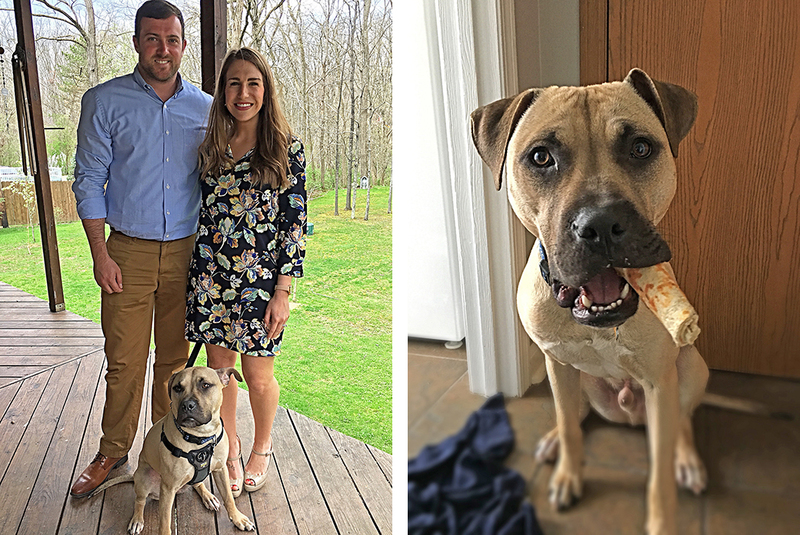 “We had been fostering a pit bull for a friend for several months, and after we returned him to his owner, we knew we wanted one of our own,” says Paula. Their only requirement was that their new dog be under one-year-old. Though they left the shelter that day without a dog, they spotted Atlas. When Paula returned a week later, Atlas was still there. She took him outside and played with him—and then shortly after, adopted him. “It was meant to be; he even had the perfect name, Atlas—we love to travel,” says Paula, who used to volunteer at the local humane society. Paula knew little of Atlas’ background, except that he had been in the ASPCA’s custody following the seizure of dozens of dogs in connection with a dogfighting investigation. Working alongside the Rock Island, Illinois, Police Department and the Federal Bureau of Investigation Quad Cities Federal Gang Task Force in Davenport, Iowa, the ASPCA helped rescue 64 dogs in April 2016—including Atlas. Once the ASPCA obtained ownership of Atlas, he was transferred to CAHS, one of several shelter placement partners that took in dogs from the case and made them available for adoption. It wasn’t obvious to Paula that Atlas had never before been in a home until after she adopted him. He didn’t know how to get in or out of a car and once inside, grew anxious and began drooling and vomiting on more than one occasion. At home, he wasn’t housebroken and didn’t know how to navigate stairs. A year later, much has changed. Atlas is now crate-trained and housebroken, can navigate stairs and gets along well with other dogs. He spends three days a week at work with his new dad and two days in doggie day care. He even has a doggie hammock in the car and enjoys going on road trips. 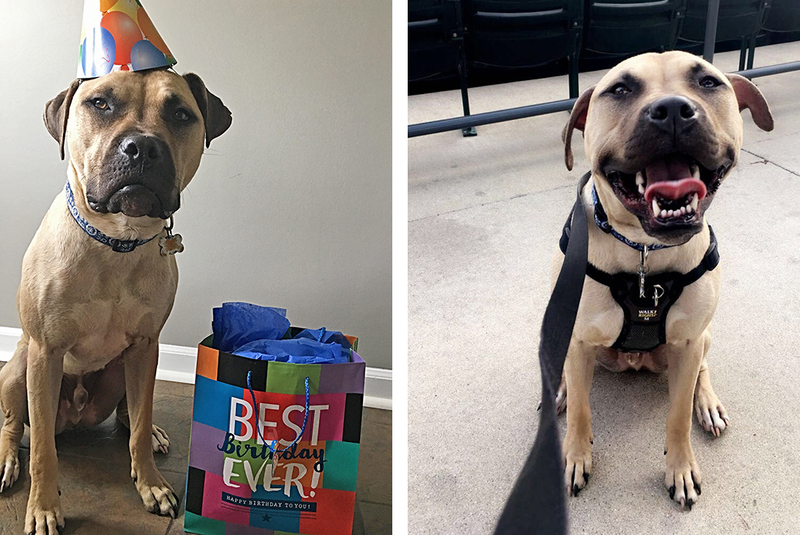 On May 19, 2017, his first birthday, Atlas was treated by Paula and Mike to a small party—with treats and toys that he unwrapped himself! He even ate his first cake—which was homemade with peanut butter and apples. As we prepare to honor National Dogfighting Awareness Day on April 8, we hope that you will help us spread awareness and fight for more victims as they journey toward new lives. By signing the Heart act petition today, you can help dogfighting victims like Atlas and Franny find loving homes faster as they move through the legal process.